Today is the 110th wedding anniversary of my great-grandparents, Elton L. and Mabel C. (Morgan) Dunham (shown at right cutting the cake at an anniversary party/family reunion held at their old homestead). In one of those strange coincidences that make genealogists quiver with delight, today is also my father's (their grandson's) birthday. 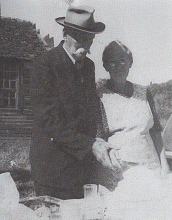 September 26 was also the date Mabel's brother Floyd married in 1908, and the date her daughter Gladys died in 1994. Elton and Mabel had intended to marry on September 9, 1896, but were forced to postpone when the bride's grandmother selected that day to expire. September 9 was Elton's birthday. And the birthday of his grandson (my father's cousin), Everett Cole. And also the birthday of my mother. "Dunham" hmmm. I know this has nothing to do with your article BUT we genealogists never stop digging. I just found your blog and have been in the midst of searching for "Ida Mae Dunham" who was married to my Grandfather's brother, Lavon "Vonnie" Moody. He died in France during WWII and no one seems to know what happened to Ida Mae. You wouldn't by some great miracle be related? (We believe she was born in OK). I'm sorry, but I don't have any info on what might have happened to Ida after the war. Most Dunhams in America descend either from John Dunham of Plymouth, Mass., or from Jonathan Dunham (alias Singletary) of Woodbridge, New Jersey. So, there's about a fifty-fifty chance that Ida's Dunham line intersects my own.